love their brand, their mission, their customer service, all of the above. always have. for awhile there judah and layla were the only ones who actually wore any (i wasnt sure those pointy little slippers could hold up against my legframe...whatever). but i finally got a pair of my own over christmas and i love them. they are perfect when its freaking cold outside but i just want to wear a t-shirt and not look stupid with ballet flats or boots on. here's the thing though: they are pricey. like $50 for adults and $30 for kids. we are okay with this because buying a pair of shoes for me means another pair is given to a kid who wouldnt have access to shoes otherwise. i'm down with that. after i loved that first pair, i wanted to get a second. so i went to america's yard-sale: ebay. i figured i could get a retired, hard-to-find, or expensive style for a bit cheaper, and since they came from the TOMS production chain (even if i was farther down the road on it than if i had bought them directly from them) i could be assured that the One-to-One thing still held true. 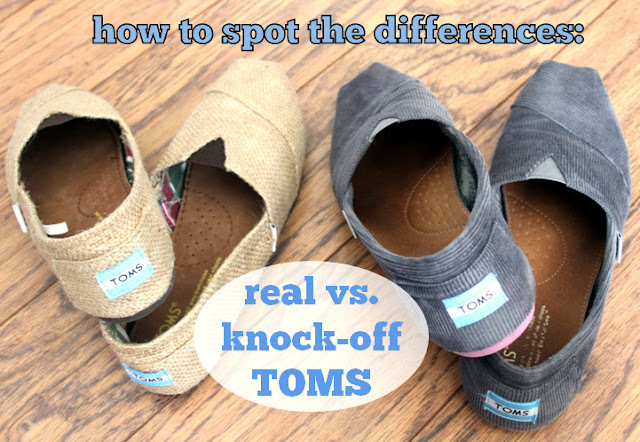 well it turns out that real TOMS arent just pricey because youre really buying two pairs. these suckers are pretty well made too, (which is good for me and GREAT for a kid who lives somewhere with lots of parasites and no sidewalks, no?) which of course drives us production costs. i found this out the hard way. long story short: i had accidentally bought fake ones. good fakes. but cheap and totally not giving anything to any kids. luckily i was able to return mine to the seller (she had actually unknowingly bought them from another ebay store which then disappeared..sketch! ), but before i did i took some pics so that no one else would make the same mistake. note: i love a good knock-off. if someone can produce a necklace that looks exactly like jcrew or a quilt just like an anthro one for a fraction of the price and people will buy it, that is awesome. but OBVIOUSLY if you start putting the jcrew logo on your stuff to pass it off as theirs, not giving them credit for the idea and pretending to be a part of their benevolence efforts then you have strayed into seriously uncool territory--called a big fat lie--and possibly illegal? 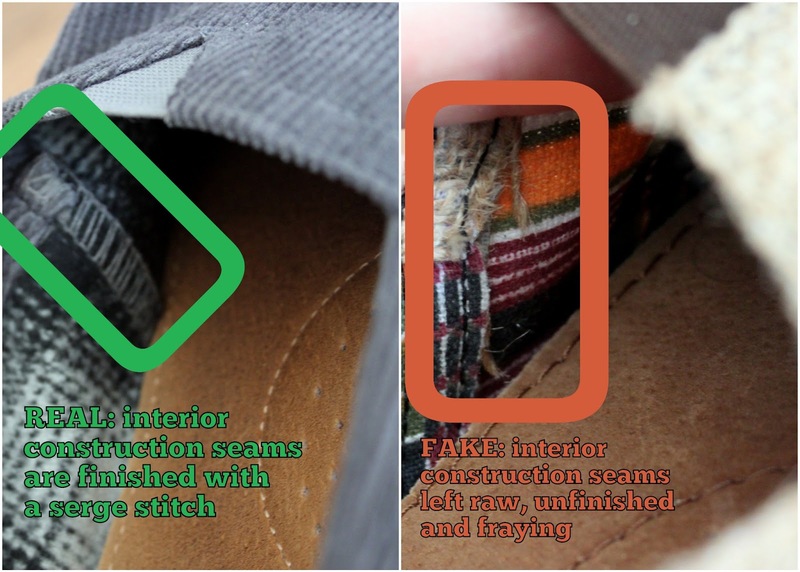 even if you dont have a real pair to compare yours to in side by side fashion this little rundown should still help you know what to look for if you are buying your shoes aftermarket. (of course you can always go on TOMS website and find a 100% authorized retailer...but if youd rather deal hunt on eBay or somewhere, then make sure you know what to look for and ask for when it comes to pictures). brands protect their logo and identity very strongly. there is no way there would be more than one real version of their typography or lettering. i believe some real TOMS have yellow stamping inside, so dont use this one exclusively to decide without other clues. it is pretty out of character for me to do a post like this regarding a consumer warning, but this one just felt really below the belt and i wanted to put the info out there in case anyone else got punked or needed to avoid doing so in the future. i think on this kind of thing no one wins if you end up with the knock-offs because your money is staying utterly outside of the production-giving chain where kids get helped and the people who have worked so hard to make this mission work dont get paid. and then self-interestedly, your shoes are crappy and will fall apart in about 10 minutes (mine even came with stretched and busted seams). PSA complete. go about your day. *i have literally nothing to say about "BOBS" by sketchers. just a colorful facial expression. Nice. Thank you for saving me hours of my life. AAAAAnd now you've got me all paranoid and angry that the ones I always thought were real might actually be fakes. They're really well made, glued-onsole, serged edges...but have the telltale forgery marks too. Grrrr. Don't come to Hong Kong/China they have knock offs for everything including TOMS. Don't worry I rock my real ones all the time. Thanks for sharing, I totally agree with you. This has been such a helpful post. For the past week, I've been debating to buy a pair of black glitters on ebay, but very skeptical about whether they were actually real TOMS at all. Since they were cheap, I thought I'd do research and couldn't find much on the net until I came here. Of course, after distinguishing all the telltale signs, they are fake!!!! You have stopped me from buying knock-offs. I couldn't agree more...I'd rather pay full price for real ones as well as doing the one-for-one deal. Wow... you are an eagle eye!! I did not see any differences at first glance! I understand (somewhat) the demand for fake $2K Louis Vuitton purses, but not $50 shoes. Thanks for the tutorial... I honestly had no idea! Looks like I just bought 3 fake pairs. But all 3 only cost me $50 total so I'm not too mad. But thanks, this was very helpful. Thank you so much for this! I just got a pair off of ebay, and they were only $5 cheaper than normal, yet I was still skeptical. I got the pair and the box literally looked like someone colored on it with black sharpie. I got out the pair and they looked real, bag, sticker, and everything. Then I saw the stamp. A chinese stamp. I got worried. So I started looking for signs that they are fake and I found your page. My shoes have so many of the signs that they are fake, but almost as many signs that they are real, too. The biggest red flags I saw were the stitching, the big difference in size (the fake toms are smaller than the real pair I have even though they are both 9), the difference in height at the heel (fake toms are shorter) and the toms flags on the heel. The "o's" is squished and the "m's" have pointy tops instead of flat tops. I also noticed something that you didnt mention: on the inside of the real shoes, near where the big toe would be, is a stanp saying "made in china" a serial number, and the size of the shoe. However, on the fake shoes, this stamp is smaller, cheaply made, and fails to have the shoe size on it. Spectacular job!! Never even noticed some of the things you pointed out. Thanks! How do you account for the changes in manufacturers? I worked in a store that carried TOMs and was the buyer for that product. Over the course of a year (2011-2012), the sizing on the TOMs we got in drastically changed. They were running "too big", pretty much the difference you're talking about. These were shipped form TOMs to us and not some third party. Just something to be aware of, sizing can change if the factory or workmanship quality changes. The sizing is now consistent, but instead of wearing my normal W8.5, i have to buy a W7.5! and can no longer purchase a men's 7 (they were about the same was a W8.5 only slightly wider...and there were tom's of patterns and prints in the men's i preferred over some of the women's) sad face. i totally agree, that is why i think the other more telltale signs that i mentioned are more important. i wouldnt make this decision based on JUST the size being a tad off. i trust that TOMS will never use a manufacture with substandard quality so that is more what i look for. and $5 is worth a fuss to this girl! My daughter accidentally ordered from the scam outlet store. Will she get her fake Toms? And do we need to cancel her credit card? This makes me very nervous. http://www.winsunshoes.com/Special-Discount-Toms-Shoes-Black-Canvas-Classics-1889.html are these fake the triangle is about the only thing that I see wrong but then again their so cheap. http://www.winsunshoes.com/Special-Discount-Toms-Shoes-Black-Canvas-Classics-1889.html are these fake the only thing I see wrong it the triangle but then again their cheap. TOTALLY fake. TOMS definitely doesnt have an outlet site. the whole fact that they have copied/ripped off the branding on the fake website almost 100% guarantees the shoes are even faker. this is their "about TOMS" section: For Toms Shoes sale on winsunshoes.com is direct from TOMS Original Equipment Manufacturer in china, we sincerely assure that you will get Cheap Toms Shoes with original quality in our website. Win Sun trading company welcome you come in our online store to purchase your favourite Toms Shoes, we sincerity hope you will get wonderful shopping experience from us. um yeah. china fake cheap ripoff! Thanks for the info. I personally love a good knock off sometimes. But when I do I don't agree with the company putting a fake logo on it. I have bought look a likes that had the knock off companies logo on it and that is all good. But it is totally wrong for a company to put the Toms logo on it- and put their trademark and sell them as the real thing. They are profiting off of people thinking they are real and stealing business from the real Toms brand. This is so helpful. I thought I was getting a good deal from a website, but I know see they turned out to be fake. I wish I had checked more into it instead of jumping the gun because of a cheaper price. Don't use winsunshoes. Mine just came in the mail and im now seeing the poor quality compared to the real ones. Are toms.lovelyshoeswholesale.com a site for fake Toms? Just to let you know the real toms soles do come out if you wear the a lot. I've had mine for about 4 years and the soles do come out. I can definitely see that happening after 4 years. I think by that point these horrible fakes would just disintegrate! One more thing to know is that after the "One for One" you should see ®, this shows that the shoes are registered with the brand.